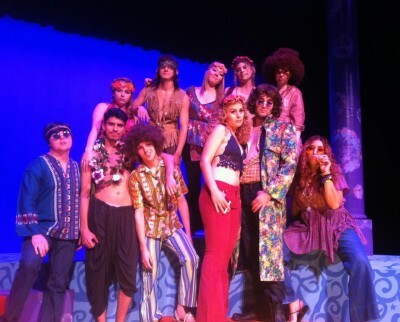 This past weekend, Shakespeare’s Midsummer Night’s Dream opened on stage at the College of the Sequoias in Visalia. They have four more performances left this coming weekend, October 17, 18 and 19. We took a moment this weekend to chat with director Chris Mangels about the show. KRL: Why did you choose to do Midsummer this fall? Chris: It’s one of my favorites and I have had this idea of setting it during the Summer of Love swimming around in my head for almost 20 years. I felt like this was as good a time as any to see if the idea had legs. KRL: What all is different about your production of this Shakespeare classic? Chris: It’s been adapted to run a bit shorter but it still features Shakespeare’s language. The setting has been changed from Ancient Greece to the imaginary college town of Athens-by-the-Bay in the summer of 1967. We call it the Midsummer of Love. The Lovers are college students, the Mechanicals are no longer blue-collar workers but instead a group of square college professors, and the Fairies are now hippies. It’s a psychedelic experience. KRL: This sounds like a lot of fun. Why did you choose to go this way with the show? Chris: I’m always concerned with accessibility for the audience and I thought the modern setting could really resonate with the baby-boomers and younger generations, as well, who have seen television footage of the Vietnam protests, hippie lifestyle, and the comedies of the late 1960s like the Richard Lester Beatles movies, Woody Allen films, and The Monkees. KRL: What do you like best about directing a Shakespeare play? Chris: He is the greatest dramatist of the English language and yet his work is so universal and adaptable. It’s always a great (and rewarding) challenge to re-imagine his work. KRL: What do you feel are the benefits of performing Shakespeare for your acting students? Chris: All theatre students should – at some point in their educational careers – pursue classical training. It demands great technical prowess and an investment in language that many modern plays do not explore as significantly. KRL: Are there any special challenges to directing Midsummer? Chris: The cast is full of newcomers to COS, many of which have never performed on our stage much less tackled Shakespeare. Combine that with a shortened rehearsal schedule (only six weeks) and a high-concept idea for us to explore (the modernization of the setting) and we all had our hands full getting it ready. I couldn’t be more proud of the cast and crew, however, who have absolutely devoured the challenge. KRL: How large is the cast? Chris: We have a cast of 25 actors, two of which are community members, three returning COS graduates, and 20 our current students. KRL: Any familiar names in the cast? Chris: Many of our cast are new faces to COS but we are pleased to have three recent graduates who happened to return to the area around the time we were auditioning. Justin Ringhofer (who received his BA in Theatre from Fresno State) plays Oberon, Anand Purewal (who received her BA in Theatre from UC Irvine) plays Puck, and Colin Helpio (who received his BA in Theatre from UC Berkeley) plays Nick Bottom. Chris: If you love the Bard or even think you hate Shakespeare, clear your head and get on down to our theatre. I’ll bet you will have a wonderful time! KRL: What else is coming up for theatre at COS this school year? Chris: Next up is The Man Who Came to Dinner, directed by Nick Terry and starring our very own Professor James McDonnell as Sheridan Whiteside. It runs November 15-23. In March, we will be featuring the hilarious musical mystery where the audience chooses a new ending every night: The Mystery of Edwin Drood. Finally, in April/May our student-lead Experimental Theatre Ensemble will debut the beautiful play, Metamorphoses, co-directed by our fantastic guest artist, David Rasner, and myself. I am absolutely thrilled about these upcoming productions! So if you are looking for something fun to do this weekend, head out to COS in Visalia and help support the arts by seeing this reimagined version of Midsummer Night’s Dream. You won’t regret it! For more info check out the COS theater department’s webpage. Tickets are $12 for adults and $10 for students and seniors, and can be purchased by calling 559-730-3907.